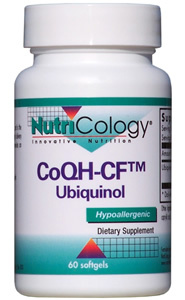 CoQH-CF™ (ubiquinol) is a reduced form of coenzyme Q10. Purchase this product now and earn 8,348 Reward Points! 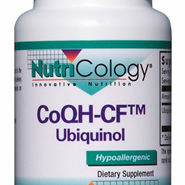 CoQH-CF™ (ubiquinol) is a reduced form of coenzyme Q10, and is the actual antioxidant form of coenzyme Q10. A unique softgel delivery system protects the content from oxygen exposure and provides an efficient way to maintain adequate ubiquinol levels. Suggested Use: As a dietary supplement, 1 softgel one to three times daily with meals, or as directed by a healthcare practitioner.